Mesh belting with chain attached to each edge for positive drive. The chain can be attached by rods that pass through the mesh or with channel/bar supports that are bolted/welded to the chain. The construction method used is based on the capacity required and the mesh will be determined by the smallest part size. 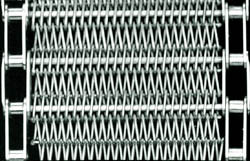 Most common meshes are balanced weave mesh woven to accommodate the support spacing.